Persona 4 for Vita and Persona 5 are a go, but Atlus also takes the series in a surprising new direction. It's a good day to be a Persona fan. Some IPs can go years without a single new entry, but today, Atlus revealed that the quirky Japanese RPG series will get three: an updated re-release of Persona 4 for the PlayStation Vita, a Persona 4-based 2D fighter for the 360 and PS3, and Persona 5, which is still in the earliest stages of development. The Vita update for Persona 4, with the tentative subtitle "The Golden," looks like a fairly standard upgrade. It boasts a new playable character, more voice-work, new animated cutscenes, and a few gameplay tweaks. 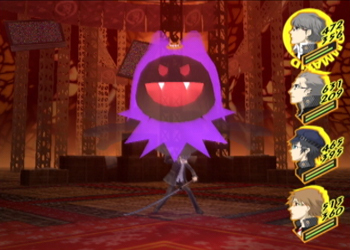 More unexpected is Persona 4 The Ultimate In Mayonaka Arena, which pits various Persona 3 and 4 characters against each other in two-dimensional brawls. This type of game represents new ground for the series, but Atlus has entrusted its development to the team behind cult favorite BlazBlue. The announcement of Persona 5 is probably the biggest of the three, but also has the least information currently available. Most of the regular Persona staff, including the director, character designer, and composer have returned and already completed some preproduction work. Details such as release date and platform are still up in the air. While there's no word on a Western release for these games yet, Persona has seen respectable sales on this side of the Pacific, so English-speaking audiences can exercise cautious optimism. The Persona 4 Vita release and fighting spin-off will see Japanese releases in Spring and Summer of 2012, respectively.